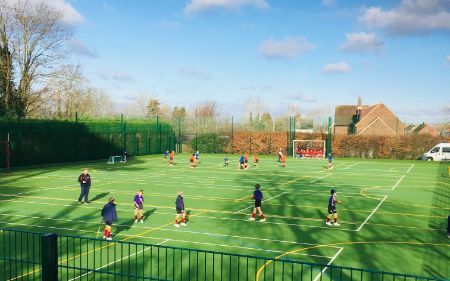 The hockey season always starts with a trip to Wellington College for their festival, this is a great chance to play 6 matches and work out our strengths and weaknesses, it was obvious that we were strong in defence but struggled to score goals, and also failed to move the ball wide. The next couple of sessions were very much about fast wide play and shooting whenever we got into the D.
This was to prove to make a massive difference to Cranmore’s U10 session and the goals started to flow at all levels. The U10’s also hosted the first ever Saturday fixture against Feltonfleet which proved to be a great success, something I am sure will be increased on next year. Looking back on the season the new Astro has been excellent and the standard of hockey is going up and up.